The MSM has forsaken its duty in a democracy and is a disgrace to investigative, unbiased journalism. The mainstream media bet the farm on Hillary Clinton, confident that their dismissal of every skeptical inquiry as a "conspiracy" would guarantee her victory. It now appears they have lost their bet. Let's do something radical and be honest for a moment: the mainstream media has smoothed the path to Hillary's coronation in countless often subtle ways. MSM "Opinion" hacks have unleashed unrelenting attacks on legitimate inquiries with accusations of "conspiracy" and obsequious kow-towing headlines such as "Can we please stop talking about Hillary's health?" Suggestions that the Clinton Foundation engaged in "pay to play" during Hillary's term as secretary of state are glossed over; yes, it looks bad, the MSM reluctantly admits, they they hurry to add that no impropriety can be proven in court. Given the foundation is run by attorneys who obfuscate the meaning of the word "is," do you really think they're going to leave tracks that can make it to court? The Democratic National Committee's corruption was downplayed, and the mainstream media's pathetic lack of inquiry was of a piece with old Soviet "news": a scapegoat or two is cut out of the leadership photo, and the DNC corruption machine moves on untouched. Consider the subtle Orwellian play of The New York Times sidebar headline after Hillary's collapse on 9/11: "Hillary leaves 9/11 event early." Oh really? This was the substance of what happened, that the candidate "left early"? All through the primaries, when Hillary won the NYT et al. splashed huge headlines declaring her victory. When Bernie won, headlines read "Hillary gains ground," not "Bernie wins another primary." Rampant election fraud in the Democratic primaries was left uninvestigated, calling to mind the way Too Big To Fail banking fraud was left untouched by the mainstream media, which happily swallowed whole suspect official pronouncements that "subprime is contained" even as the financial system was veering into complete collapse in 2008. There is an easy way to identify bias that we can all play at home: substitute "Sanders" or "Trump" for "Hillary" or "Clinton". If Donald Trump collapsed on the sidewalk and had to be tossed in the van like a sack of rice, do you think the mainstream media would be bleating, "can we please stop talking about Trump's health?" Please don't even try to claim that oh, yes, the MSM would rush to run that headline. Do you honestly think CBS would edit out a reference to Bernie Sander's fainting "frequently"? 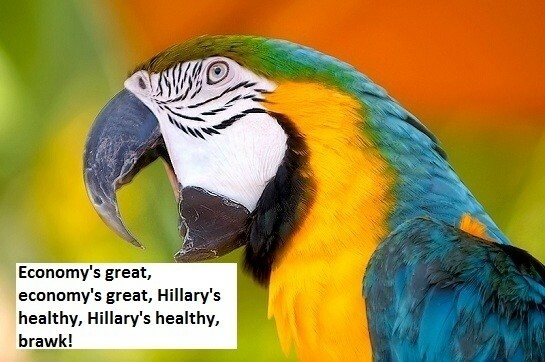 Get real, people: the MSM only edits out negative stuff on Hillary. CBS Caught Editing Clip, Transcript In Which Bill Clinton Says Hillary Fainted "Frequently"
Do you honestly think an MD who questioned Donald Trump's health would find his show immediately taken off the air? Rather then being summarily taken out and shot for questioning the MSM's scheduled coronation of their candidate, his show would have been pushed into prime-time and placed in rotation. The mainstream media has failed: it has failed its sacred duty in a democracy to report the facts and let the voters decide what is or isn't important, it has engaged in orchestrated deception, refusing to report facts that cast a shadow over their chosen candidate, it has failed to cast a skeptical eye on its chosen candidate's actions and private accumulation of wealth, and it has attempted to block legitimate inquiries into Hillary's wealth and health with crass, propagandistic attacks and smear campaigns against anyone who dares question Hillary's MSM-granted "right" to be coronated president in January 2017. Look, we understand your fear of crossing the Clintons. Their Enemies List makes Richard Nixon's infamous Enemies List look like a squabble over seating at a church social. The body count of those who were in a position to rat-out the Clintons reminds observers of the way an astonishing number of eyewitnesses to JFK's assassination turned up dead under mysterious circumstances. Once again, substitute names. Would the mainstream media be so incurious if Bernie Sanders had accumulated a $100 million fortune via foreign "donations" to his foundation while he was serving as Secretary of State? If acquiring $100 million in "donations" from overseas dictators and corrupt officials is "normal" for the secretary of state, then where is John Kerry's $100 million in "donations"? Look, if you love Hillary to death, that's your right. But we as a nation cannot afford to blind ourselves to blatant media bias and propagandistic suppression of legitimate inquiry, even on behalf of politicos we favor. What happens when the status quo media turns a presidential election into a referendum regarding the media's ability to shape public opinion and direct "purchasing" choices? They put their ability to command advertising revenue at-risk. Hubris convinced the media that they are king makers, even though the Deep State sees them as little more than useful idiots. --Sending those dollars to the increasingly fragmented world of the internet. That is the same internet that has defied efforts to put-a-meter on it. That is the same internet that defies the artificial gates that permit orderly bilking (sorry, billing) and vertical integration that enables huge paychecks. So, clearly, having planted their flag, the media simply cannot allow anybody but Hillary to win. Regardless of the costs. But what if she loses anyway? That's an interesting question. The MSM bias is so painfully obvious that its remaining credibility has been squandered. That loss of credibility will usher in a banquet of consequences, perhaps including a decline in eyeballs and revenues. Now that CNN et al. have "done everything we can to help Hillary," what happens to their audience ratings and revenues should Hillary lose or drop out of the race for health reasons? Dear mainstream media: you have lost your credibility because you are incapable of skeptical inquiry into your chosen candidate or official statistics/ pronouncements. Your dismissal of skeptical inquiries as "conspiracies" or "hoaxes" is nothing but a crass repackaging of the propaganda techniques of totalitarian state media. Dear MSM: You have forsaken your duty in a democracy and are a disgrace to investigative, unbiased journalism. You have substituted Orwellian-level propaganda for honest, skeptical journalism. We can only hope viewers and advertisers respond appropriately, i.e. turn you off. Here's the mainstream media's new mantra: "skepticism is always a conspiracy or a hoax." 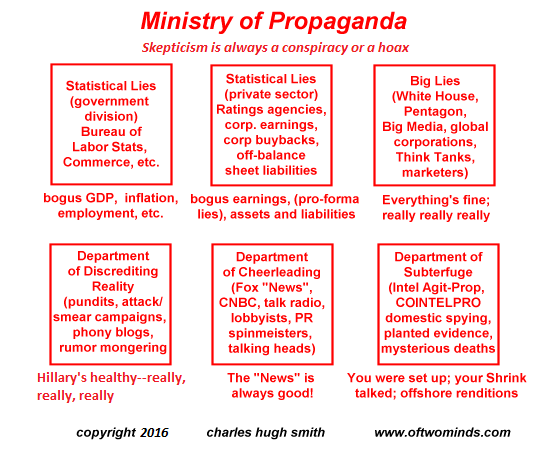 The Ministry of Propaganda and the MSM are now one agency. Thank you, Mark T. ($5/month), for your much-appreciated generous re-subscription to this site-- I am greatly honored by your steadfast support and readership.